Colin Thornton listed a new property at 9333 119 ST in Delta. I have sold a property at 3015 SANDLEWOOD WAY in Port Coquitlam. Greg & Colin have listed a new property at 203 3088 FLINT ST in Port Coquitlam. Two bedroom condo with over 1,000 square feet of living space & 2 full bathrooms. You will love the spacious open floor plan with bedrooms that lie on opposite sides of the unit. Nice bright kitchen with lots of cupboards & counter space, tilefloor & newer appliances. Big open living room and dining room with gas F/P & access to the large covered west facing sundeck .Gorgeous Mountain Views from the sundeck. Nice big master bedroom with his & hers closets & a 4 pce ensuite. In suite laundry with newer front loading washer & dryer & a large storage room. Brand new roof in 2014. Please visit our Open House at 20494 Deniza AVE in Maple Ridge. 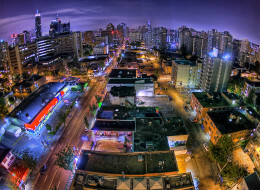 A fisheye lens shot of downtown Vancouver. The future of Metro Vancouver's real estate lies with baby boomers who hold an astonishing $163.4 billion in mortgage-free property, said the city's "condo king" in anannual address. "What will be the impact of that equity in the hands of an aging population in our marketplace?" Bob Rennie asked the crowd of almost 1,000 developers, politicians and media at the annual Urban Development Institute general meeting and lunch Thursday. "This might just be the tip of the $163.4 billion iceberg."